This method is just one of many different methods of firing pottery. The reason, I am describing it here is because this method seems to give the highest rate of success on my courses, with only a rare instance of students pots cracked. Before I used this method, My students fired pottery in an open fire. This seemed to result in about 60% of broken pottery after the firing, due to thermal shock (temperature changes too quick). A number of changes occur before and during firing of pottery. Most important is that the pottery is made without any air pockets trapped in the walls or bottom of your pot. If there are air pockets, it is possible your pot will explode during firing. Air expands as it is heated, causing the explosions. Secondly, it is VITAL the pottery is dried out, and that the temperature is raised slowly. 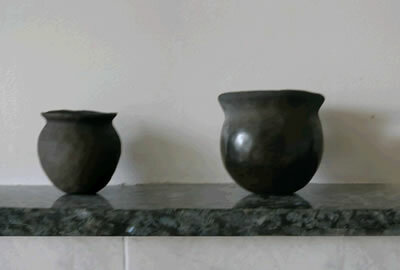 After the max temperature is reached and the firing process is completed, pots need to cool down slowly. If clay heats up too fast, or cools down too fast, the stresses imposed on the clay become too big, causing cracks to occur. The reason for this is that clay expands and shrinks during firing. Thirdly, It is important that the pots are heated evenly. If one side is hotter then another side of the pot, the shrink-rate of these sides will be different, again causing failure. Room temperature - 100 C. Clay is drying out. The pots will shrink at this stage up to about 10%. 100 C - 500 C. The chemical water is driven off. The pottery does not shrink during this phase. Although a chemical reaction has occurred, the pottery is not yet useful. It is weak, and will disintegrate during regular use (cooking on a fire) However, it will never be able to return to the slippery clay you started out with. 1000 C and more. At this stage the microscopic crystals of mullite and quartz are knit together into larger and larger crystals until the pot is pretty much one big piece stone. Pottery at this stage is like the plates and mugs in your cupboards. This earthenware is NOT useful outdoors. If heated unevenly, it will crack. Luckily, it is pretty much impossible to reach this kind of temperature using a primitive firing method. Right, enough of the theory, let's get on with it! 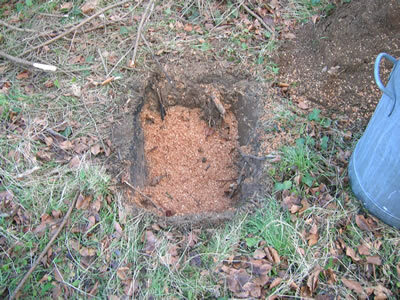 First thing to do is dig a pit about a foot and a half deep in an area where there are no pineroots or bog in the ground (you don't want to fire the forest around you as well! Underground fires can rage for weeks unnoticed and suddenly flare up to destroy whole wilderness areas!!!). This hole needs to be about a foot by a foot if you only have one small pot. Our hole is one by two feet to accommodate more pots. 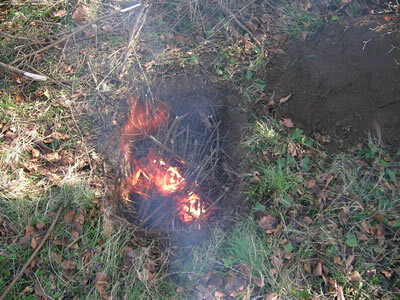 Once the hole has been dug, light a fire in it to ensure the pit is dry inside. 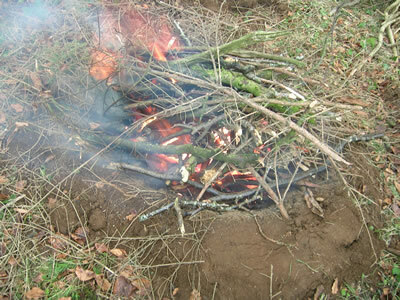 Once this fire has burned out, fill the bottom three inches of the pit with dry sawdust. Lay your pots carefully inside the sawdust. Make sure that your pots aren't touching each-other and that they tend towards the middle of the pit, rather then the sides where the fire will be less hot. Now stuff the pots with more sawdust, and put another layer of sawdust on top so there is a layer of about 1 to 2 inches above the pots. 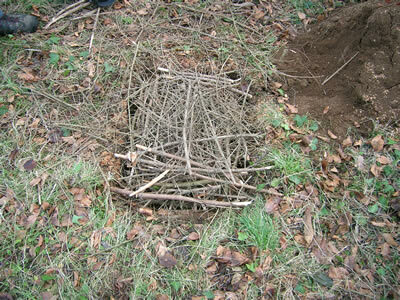 Now fill the rest of the pits with sticks. 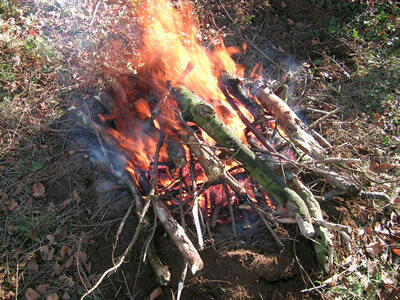 Make a nice mix by using kindling, "squaw-wood" and bulkwood altogether. I also like to put the branches and sticks crosswise so there are enough gaps for the wood to catch. Light the fire from the top. Now, heap as much fire-wood as you can find on top of this fire. You want this fire to be huge! Try and keep the fire well lit for a good 3 hours. After that, let it burn down naturally. Once all the wood is turned into embers, you might be tempted to scrape them away to have a look at your pots. Don't. Just let the embers turn into ashes, and let the ashes cool down overnight. The result will be much more exciting after a nights sleep. The pots are black, because there was no oxygen available around the pot. 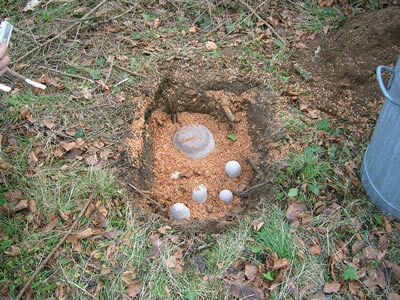 If these pots had been fired in an open fire, they would be lighter in colour, except perhaps where combustible material touched the pots. The black is burned in the clay and cannot be scraped or sanded off.